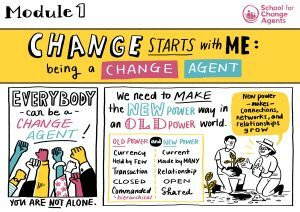 The theme for week one of the School for Change Agents is “Change begins with me” and I will be leading the session. So I thought I should tell a little of my own story and my role as a change agent. As a 19 year old student, I was a passionate humanitarian who wanted to rid the world of inequity and injustice. I was idealistic and active in several causes. University was a massive culture shock for me because, coming from a blue collar family, I recognised a profound gap between those who had been brought up with affluence and those (like me) who hadn’t. Immediately, I felt out of my depth and under pressure to prove myself in my new middle class world. Often when I went into smart shops and restaurants, I thought someone might ask me to leave because I didn’t belong there. I still get that feeling that I will be found out. I was an undergraduate in social science. I was fascinated by people and systems and what makes them tick. One of the first topics I studied was the tension between agency and structure, one of the most fundamental debates in social science. What drives change in organisations and systems? Is it structure (the influencers in the external environment) or is it agency (the capacity of individuals to make their own choices and to take action in a given environment)? As a student, I truly believed in the power of agency. I was inspired by the leaders of the great social movements: the Women’s’ Suffrage Movement, the American Civil Rights Movement, the environmental campaigners who were making such a big impact at that point in the late 1970s. These were leaders who had no hierarchical power and few resources in a structural sense yet through collective agency were able to mobilise for action that literally changed the world. Education gave me agency. After graduating, I was thrilled to get my first job in local government and the start of a career in public service. As a new employee, I got immersed in systems and processes that were all about structure. The idealist change agent was still there, just dormant, as I strove to prove that I could do a good job and achieve my goals within the status quo of the existing system. The strategy worked as I progressed to become a countrywide leader of improvement in the English National Health Service. I ended up leading programmes across the whole of England, engaging thousands of people, to reduce patient waiting times for care and to improve the outcomes of care for people with cancer and heart disease. This work involved large scale programmes with a focus on methods and structures for quality improvement. Whilst the programmes helped deliver results and the outcomes and experiences for patients improved, there was always a sense for me that we never really achieved our potential. It felt like an additional motivational element was needed. Ultimately, if we were going to enable improvements for people who use our services across the whole country, we needed to build a movement of at least a million change agents. Fast forward to the present day. The reform orthodoxy in public service has, over the past two decades, been largely driven by structural approaches; top-down change, performance targets, payment by results, statistically driven improvement methods, programme management offices (PMOs). Yet across the world, we see a shift taking place from a focus on structure to a focus on agency for large scale change. History shows that, on its own, structural intervention cannot deliver change at the depth, speed and breadth that is needed. Most current health and care transformation efforts globally are now built on a premise of increased agency for patients and families. We want patients to take more control of their own health and have more power over decisions about their care. was this a structural issue - i.e., the sense of permission is externally generated and is a systems condition? 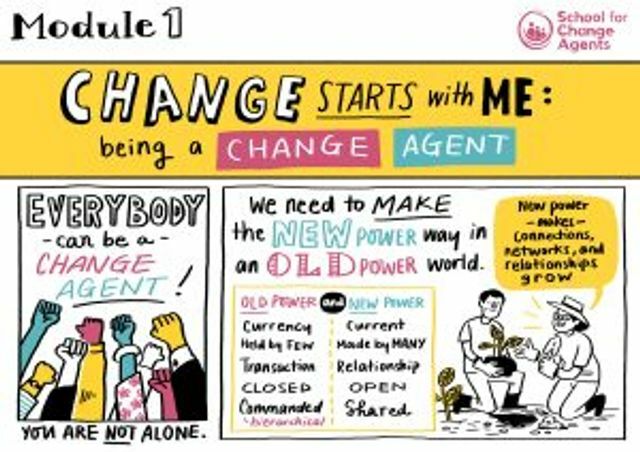 was this an agency issue – i.e., the permission issue comes from a lack of skills and lack of sense of power for making change? These are complex situations and there is likely to be a combination of both structure and agency at play here. However, if the issue is a structural one, it can take a decade to change a permission culture. On the other hand, evidence tells us that it is possible to build agency for change and to do so effectively and quickly. So if we focus on agency, we can help make change happen more quickly. We can build agency at both an individual and collective level. Individual agency is about people building their own skills, confidence, knowledge and networks. Collective agency occurs when people act together, united by a common cause, harnessing the power and influence of the group and building mutual trust. Collective agency takes us beyond the typical “top down and bottom up” approaches to healthcare improvement, and beyond the lens of “service delivery” through which formal systems leaders often conceive the problems we are trying to solve. It increases the likelihood of bringing positive disruption into the system for faster change and bigger outcomes. Collective agency was what the great social movement leaders harnessed to change the world. Collective agency unites everyone with an interest in better health and healthcare outcomes, whether we are patients, families, advocates, employees or system leaders. It is about working in ways that honour the diverse experiences and skills that people bring and the impact they can make. It is about igniting the collective brilliance of people who need the system and work in the system by enabling everyone with an interest in a specific outcome to contribute in a meaningful way. That’s why, in the School for Change Agents, we focus on building agency. One of the biggest barriers I see in the current system is the mindset of leaders. Often, strategic leaders who have been schooled in structural, top-down approaches to change don’t believe that change agency is a legitimate solution to some of the biggest challenges in our current healthcare systems. I predict that over the coming few years we will see that change. Now I am in the last decade of my formal career. My 19 year old self is far more dominant in my life now, like my “inner child”. She is no longer tucked away. Her ideas, approaches and methods were spot on. It just took me more than three decades to reconcile with them. I am proud to be a rebel healthcare change agent and stand shoulder to shoulder with others who share the same goals and values. I feel a big responsibility to be true to my 19 year old self and help deliver the things she stood for. So being part of the School for Change Agents isn’t just a “nice to do”; it’s the story of my life. It’s about honouring what and who really matter and giving recognition to the approaches that can make the biggest difference. Each of us who chooses to be a change agent and challenge the status quo of the current system doesn’t choose an easy life. We can end up feeling ostracised and alone because we make an effort to improve things that isn’t always welcomed by others. Joining the School for Change Agents means that WE ARE NOT ALONE. We become part of a vibrant community of 4,500 change agents in 45 countries connected virtually with each other. If every one of us can build our agency and make a little more difference, we can have a positive impact across the world. Awesome!